"Sampath Speaking" - the thoughts of an Insurer from Thiruvallikkeni: politics of statue ~ Thiruvalluvar in news ! Truth is the speaking of such words that are free from the least degree of evil to others …….. immortal words of Thiruvalluvar. The tenure of 14th Assembly of Tamil Nadu ends in May 22, 2016. Elections to the State Assembly will be held on 16th May 2016 - there are over 5.79 Crore voters in the electoral rolls and 65,616 polling stations in Tamil Nadu. Elections code of conduct is in place. Residents are feeling happy that walls are free from the menace of posters and walk on pavements unhindered by banners. The model code of conduct came into effect on March 4 and subsequently, about 13,000 cases of defacement of walls and 4,000 banners were reported in Chennai with Corporation staff already on the job of pulling down posters in various places. They are also covering the names of political leaders to ensure that none gets undue mileage. 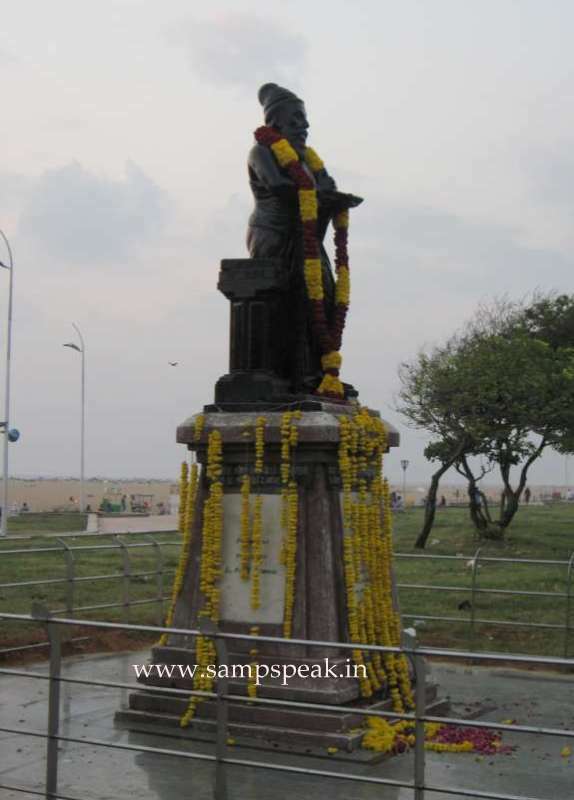 Way back in Aug 2009, a bronze statue that had stood covered for years was relieved – that of Tamil saint Poet Thiruvalluvar unveiled at Bangalore whilst at the same time one of Kannada Poet Sarvagnar was unveiled at Ayyanavaram, in Chennai. Many would have forgotten that the issue of statue had been simmering and potentially threatening relations from 1991 atleast and was infact one of the demands of Brigand Veerappan for release of matinee idol Rajkumar. The CM of Karnataka BS Yeddyurappa took a commendable move forward by announcing that the statue would be unveiled at Ulsoor by the CM of Tamilnadu. The Elections are not yet felt ~ sooner you would have leaders and contenders sweating out – organising roadshows, street meetings, cycle rallies – most of them are things of the past. A few years ago, during the elections in Uttar Pradesh Election Commission (EC) ordered masking of the umpteen elephant statues that Mayavati had erected across the state. In Tamil Nadu in 2014, they issued orders to cover CM’s pictures on the boards of "Amma Unvagam" (Amma Canteens), her block-buster food security initiative that serves hot cooked meals to thousands of people every day. Some one from a smaller party quipped can they cover - ‘the rising sun and hand too’ ! Now Salem is in news ! 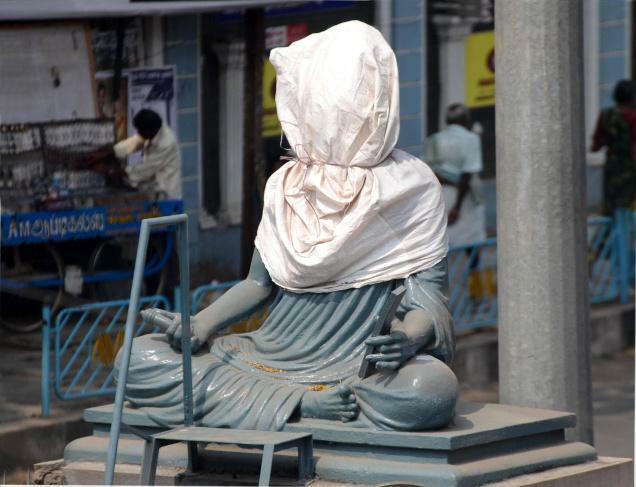 The Salem Corporation has placed a worker under suspension for covering the statue of Tiruvalluvar with white cloth recently. The statue is located in the Salem (North) Assembly Constituency near Old Bus Stand. It had been covered by Santhakumar, a staff of the water supply wing of the civic body, after the model code of conduct came into force. Complaints poured in from the pubic and political parties who demanded that the statue be uncovered. District Electoral Officer and Collector V. Sampath ordered the Revenue Divisional Officer, Tahsildar and Village Administrative Officer to uncover the statue. …it is a mistake no doubt – but should action be taken against a small time Worker of the Corporation ? – it is easier always ! !